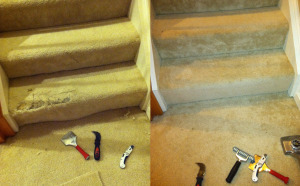 If your carpet is damaged and needs to be repaired call Mighty Clean. We are experienced in all types of carpet repairs, whether your carpet is buckling and bubbling or coming apart at the seams, we are your carpet repair specialists! We repair carpets in all of Northern Virginia including Fairfax, Centreville, Chantilly, Reston, Ashburn, Manassas, Haymarket, Bristow, Gainesville, and Fairfax County, Prince William County, and Loudoun County. When properly installed carpet should almost never become loose and need to be re stretched. When you see wavy carpet that ripples, buckles, and bubbles up it needs to be re stretched. Why does carpet become loose and need re stretching? If it is colder outside when carpet is installed and the carpet is not given proper time to adjust to the indoor temp it is tougher to stretch and often becomes loose and buckles after just a few weeks. If the installer did not use a power stretcher to install the carpet (not a knee kicker, a knee kicker is never enough) the carpet will likely become loose over time. If you have a permanent stain, a burn mark in carpet, or damage from a cat or dog scratching at the carpet a patch may be the repair you want. Getting a perfect patch that can’t bee seen is tougher than you may think. If you cut through a row of fibers, cut the patch just a little to big or small, don’t lay the patch in the direction of the nap, or make a tiny mistake the patch will always look obvious. Spare carpet for a patch can come from scrap from installation, a closet, or even under a couch!